The idea of "race" played an increasing role in nineteenth-century British colonial thought. 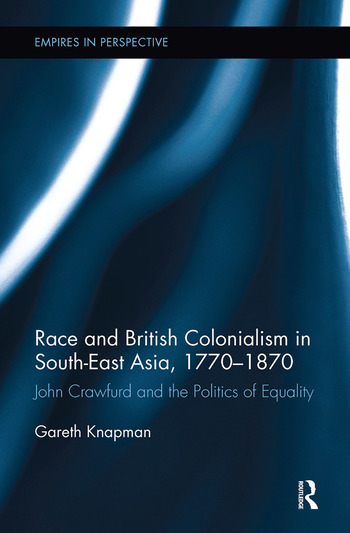 For most of the nineteenth century, John Crawfurd towered over British colonial policy in South-East Asia, being not only a colonial administrator, journalist and professional lobbyist, but also one of the key racial theorists in the British Empire. He approached colonialism as a radical liberal, proposing universal voting for all races in British colonies and believing all races should have equal legal rights. Yet at the same time, he also believed that races represented distinct species of people, who were unrelated. This book charts the development of Crawfurd’s ideas, from the brief but dramatic period of British rule in Java, to his political campaigns against James Brooke and British rule in Borneo. Central to Crawfurd’s political battles were the debates he had with his contemporaries, such as Stamford Raffles and William Marsden, over the importance of race and his broader challenge to universal ideas of history, which questioned the racial unity of humanity. The book taps into little explored manuscripts, newspapers and writings to uncover the complexity of a leading nineteenth-century political and racial thinker whose actions and ideas provide a new view of British liberal, colonial and racial thought. Gareth Knapman is a researcher at the Australian National University.